Diving on Phi Phi Island, dive sites, dive courses with dozens of articles and images on Phi Phi diving. Phi Phi Hin Daeng is one of Thailand's most extraordinary dive sites. Just 45 minutes from Phi Phi Island by speedboat, Hin Daeng brings you some of the most dramatic advanced diving in open water. This is one of the best dive sites to catch a glimpse of the large pelagic species like the W... read more. The Koh Phi Phi Manta Ray is a sight to behold but not one that can experienced regularly. The manta are nomadic and appear at certain times of the year on their migratory paths which happen to be close or near some of Koh Phi Phi's key dive sites. ... read more. Phi Phi Diving has many possibilities whether you are an out and out beginner and want to learn to dive or you are an experienced diver in search of adventure. Phi Phi Diving has many dive schools with excellent credentials and a superb range of dive sites. ... read more. A Phi Phi diving course gets you a qualification in safe diving on one of Thailand's most beautiful islands. 29 degrees warm all year round with some of the best diving reefs and the best above water scenery in Thailand, this is a fantastic location to get on a life long journey in diving.... read more. Phi Phi Island has several professional dive centers to walk you through your first try dive all the way up to Instructor if you like. You can also pre-reserve your place on any of these dive courses (as well as fun dives) online with Phi Phi Scuba here.... read more. Garang Heng is a remote dive location ideal for those busy high season days or when you feel like an explore with no other dive boats around. This submerged reef can be home to leopard shark and is covered with hard and soft corals at about 17-24m depth... read more. Loh Samah diving and snorkeling can be some of the prettiest underwater experiences on your time on Phi Phi. Loh Samah is on the south east corner of Phi Phi Ley and has a small beach, a snorkeling reef inshore and an island offshore. It also is the access route to Maya Bay when the entranc... read more. Bida Nok is the larger of two limestone cliff islet with similar topography to Bida Nai and again directly South of Phi Phi Leh. Bida Nok and Bida Noi are separate dives but most commonly these two dives are made on the same day trip. Your dive generally begins just outside a large sheltere... read more. The last year on the island was a tough one, following the Tsunami of Dec. 26, 2004. However, things are looking up. Most of the businesses have reopened, and everyone is looking forward to a good year. The community of the Phi Phi is a close knit one, and we all want to try and get back to... read more. It has been a busy month! I started the month off with a group of volunteers coming over from Fallibroome High School in Long Island, USA. This was a group of 22 kids aged 14 to 17 years old, and 3 teachers. Their aim was to do community service aiding in the aftermath if the tsunami.... read more. The island has calmed down a bit after the busy month of January. The dive shop is now running very well, which means that I get to go out and dive more. As well as diving, I had the pleasure of my dad coming over to visit me here. ... read more. If you thought Phuket was the only place to check out in Thailand, you couldnï¿½t have been more wrong. Phi Phi Islands is as fabulous, if not more, than Phuket. This place was made famous, all thanks to the filming of the Leonardo Di Caprio starring the movie "The Beach".... read more. Bida Nai is a popular dive site around Phi Phi Island and a must for any scuba diver visiting Phi Phi. Like its larger neighbor, Bida Nok, Bida Nai is a limestone cliff islet with similar topography and equally diverse marine life.... read more. Whales sharks and other large pelagics like Manta Ray come to Phi Phi Island every year. They are rerlatively rare though: my luck is not in as in 15 years of scuba diving off Phi Phi Ley and Koh Bida I have never had the chance to encounter one.... read more. When I was visiting Phi Phi Island, I was told that the PP Visa Diving Centre has some wonderful diving trips and other underwater activities. I wasn’t disappointed when I checked out the place. I had mailed the help desk at PP Visa Diving Centre several days before arriving. The arrangemen... read more. Phi Phi Diving has many advantages to Krabi or Phuket Diving because you are right on the reefs.It only takes 10 minutes to arrive at the first div-able reef Hin Dot and Phi Phi ley reefs are only 20-25 minutes from the main pier.... read more. There are over 10 diving centres catering to Phi Phi Island as divers from around the world enjoy staying on this island paradise and go diving. The Phi Phi Island group includes a number of small islands and there is great diving in the area.... read more. When you set your sights to the Phi Phi Islands as a diving destination for barracuda, you are headed for some of the most fantastic diving you will ever experience. There are a remarkable number of dive sites that offer colorful and alluring barracuda diving for novice and expert divers al... read more. 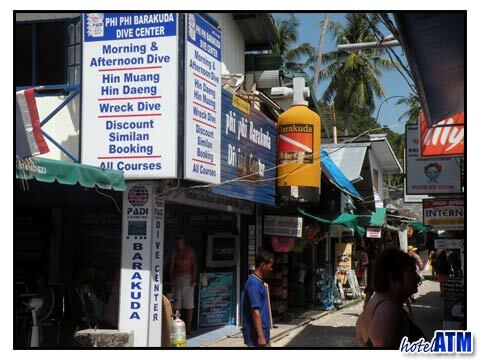 Phi Phi Dive centres regulate their course and fun dive prices centrally. This allows a defined profit margin so that the business can reinvest in the business. This is for safety standards. Discounts are available if you have your own equipment or for dive masters and above.... read more. PADI courses are available to book online with the Phi Phi Scuba Divign Center. Recreational Fun Dives and Courses from Discover Scuba all the way through to Dive-Master are available on Phi Phi Island with some of the world's best dive sites in close reach.... read more. Phi Phi Scuba Diving Centre Is one of of the Largest diving centres On Phi Phi Island. Phi Phi Scuba of Diving Centre is famous for it’s position right On the corner of one of the these the most famous crossroads on the beach path, only 120 metres from the main pier. The large distinctive... read more. On Phi Phi Island I chose Harlequin Divers to get me started with diving and I chose to do the Open water PADI course. The Harlequin divers have their office over near the Phi Phi School just beyond the first bay at Tonsai Bay and bill themselves as Thailand's Premier Dive School. I wasn't ... read more. It has been a hot, hot month!!! Mid April hosts the holiday of Songkran, Thai New year. It is the most welcomed of Thai holidays, as the celebration has now become a full on water fight, which is relief from the heat. Traditionally, it is a family holiday where all the family members gather... read more. There is no better place to dive in Thailand than Phi Phi Islands. You can fly from Bangkok to Krabi or Phuket Airport in just over an hour, and there, after taking a one and a half hour boat ride, it will bring you to Tonsai Bay at Phi Phi Village. Here, scuba diving with Viking Divers is ... read more. Learning to dive on Phi Phi is an excellent start to your dive career. The Andaman Sea is home to prolific marine life from corals to schooling juveniles to the Manta ray to the Whale Shark. The ocean floor gives rise to Phi Phi Island's extensive reefs, steep cliffs, granite walls and lime... read more. From 19th September- 21st September and with the key backing of Project AWARE, SSI and Greenfins Thailand, Blue View Divers on Phi Phi island, promoted and structured 3 days of organized activities for the International Clean up Day 2008. In all the village, with the help of Blue View Diver... read more. "On Phi Phi, Dive with Island Divers!" A simple command but one I was destined to follow and one I was glad I did. From a very glamorous site right on the beach, Island Divers is the obvious location for one of Phi Phi Island's best dive schools. ... read more. Situated close to the Phi Phi Islands and easily reachable by day trip are some of the most spectacular dive sites in the world. Phi Phi Island has a great variety of dive sites very close to the islands of Phi Phi which leap vertically out of the sea to make a splendid back drop for your d... read more. Phi Phi Island diving conditions are fairly consistent with dives during different seasons having their own unique advantages.Phi Phi has a small tide so the conditions are changing all the time. Westerlies in low season effect visibility.... read more. If you want your children to get into the warmth of the tropical seas of Phi Phi Island in a big way, get thrilled in a colorful underwater adventure or just go for a dip and see the world below the surface, let them try scuba diving on Phi Phi Island. For fun and kicks beyond cliff jumping... read more. PP Sea Frog Diving Center is one of Phi Phi Island’s oldest dive operators and has their office outside the front PP Palmtree Resort in the main village on Tonsai Bay. Divemasters and Instructors are ready to get you out to the reefs to explore this amazing island.... read more. Shark Watch On Phi Phi Island. This article provides a guide to a good tour off shark point off Long beach where many come face to face with one of their greatest fears, namely sharks in the flesh...! This tour intrigues snorkeller and divers a like.... read more. Phi Phi Island is a wonderful holiday destination. The pristine beaches, stunning natural beauty, great hotels and resorts, delicious restaurants and a diverse selection of activities, recreation and nightlife all combine to create the perfect holiday for destination.... read more. Anemone Reef dive site west of Phi Phi Island is a rocky pinnacle just 5 meters below the surface covered with brightly coloured anemones. It is about half way to Phuket and is in close proximity to the Phi Phi Shark Point (Hin Musang) and King Cruiser Wreck.... read more. Hin Dot is a submerged pinnacle off Koh Phi Phi Don's south western headlands just outside Tonsai Bay and as Garang Heng it’s another site only visited by Phi Phi diving boats and liveaboards. Hin Dot (also known by some dive centres as ‘Chimney Rock’) is a great multi level dive when the c... read more. PADI (Professional Association of Diving Instructors) is the main scuba diving teaching medium on Phi Phi Island Thailand. There 17 different dive establishments, including resort operations, from the one man band independent to the fully fledged 5 star IDC PADI school.... read more. If you are visiting Phi Phi Island and have dreamed of becoming certified than you will be delighted to learn that there are PADI courses available to help you get certified and enjoy the wonderful world of diving. Tonsai Village on Phi Phi Don has a surprising number of excellent schools t... read more. Over the last 8 years I have dived with Moskito (Mosquito) Diving as an advanced student and a fun diver and never enjoyed diving more. Based in the old village near the pier Moskito (Mosquito) Diving has a long history of quality diving school serving the community... read more. King Cruiser Wreck was an old car ferry which sunk after hitting Anemone Reef and now provides the best wreck dive around Phi Phi Island. Located to the west of Phi Phi Island about half way to Phuket, it’s the largest wreck accessible to recreation divers in the area at 85 meters in length... read more. Don’t forget your basics, if it’s been a while since your last dive you should take a Scuba Review. This means that you have done a PADI course or some other course of similar standing and need to refresh you mind on the equipment, the systems and the safety.... read more. Shark Point dive site or Hin Musang to the west of Phi Phi Island is named for an overwhelming presence of Leopard Sharks. It is not to be confused with the (local) Phi Phi Shark Point (Hin Bida) which is just off the east tip of Phi Phi Lay’s southern most tip.... read more. Maya Bay made famous by the movie The Beach offers scuba divers multiple dive locations depending on experience. The bay is a very popular snorkeling spot but is good for new, less experienced divers and even dive training. For more experienced divers, the Maya North Wall is especially reco... read more. If you're thinking about living in paradise and changing careers to become a recreational diving instructor on Phi Phi Island, then you are going to need information about IDC on Phi Phi Island. It is a new approach to diving instructor training and is unique to Southeast Asia and the Phi P... read more. Phi Phi Island diving is one of the most popular amongst the Swedish. Diving enthusiasts from all corners of the globe visit Phi Phi Island for spectacular diving, recreation and relaxation; however the Swedish have found a niche with Phi Phi Island because they have found many Diving Instr... read more. Koreans have found Phi Phi Island to be the most popular diving spot in the world. Divers from all over visit Phi Phi Island to experience the wonderful diving. It is the perfect get away for diving, recreation and rejuvenation. It is Phi Phi Islands Diving Instructors that are fluent in th... read more. Phi Phi Island diving is one of the most popular amongst the Japanese. Diving enthusiasts from all corners of the globe visit Phi Phi Island for spectacular diving, recreation and relaxation; however the Japanese have found a niche with Phi Phi Island because they have found many Diving Ins... read more. The Germans have found that diving on Phi Phi Island the be their choice of diving locations. Divers from all over the world visit Phi Phi Island for outstanding diving, recreation and relaxation; it is the Germans that realise that Phi Phi Island is the place where language isn't an issue ... read more. Twenty years has taken Moskito Diving a long way around the Phi Phi Islands. Moskito Diving was the first that dared to go diving in and around Phi Phi - when it was considered dangerous and a nearly impossible feat. From a tiny shack started by an old Austrain, who built his own little sho... read more. Phi Phi Island diving is among the most popular in the world as diving enthusiasts from all corners of the globe visit Phi Phi Island for spectacular diving, recreation and relaxation. The variety of Dive sites, the choice of Dive schools are ideal for learning.... read more. Many men and women fall in love with diving and snorkeling and try to plan diving holidays or snorkeling holidays. As they research destinations for the ultimate diving holidays or snorkeling holidays they undoubtedly stumble on Phi Phi Island.... read more. PADI and SSI both follow the same standards and certifications are interchangeable but pricing structures differ due to course materials. On Phi Phi island you can go to most dive schools and dive with either the PADI or SSI accreditation.... read more. Phi Phi Island diving is one of the most popular activities at this wonderful holiday destination. People from around the world enjoy their holidays on Phi Phi Island or even day trips from nearby Phuket or Krabi. The amazing scenery of Phi Phi island with limestone cliffs and aquamarine se... read more. Every dive pro has their own, tips and tricks they use on a day to day basis, some are commonly known and others are so obvious you’ll wonder why you didn’t think of it. Either way we’ve compiled a list of tips for diving around Phi Phi Island to help you get the most from your dives an... read more.